UK: Trade association RenewableUK is leading the campaign to persuade the government to target 30GW of offshore wind by 2030. 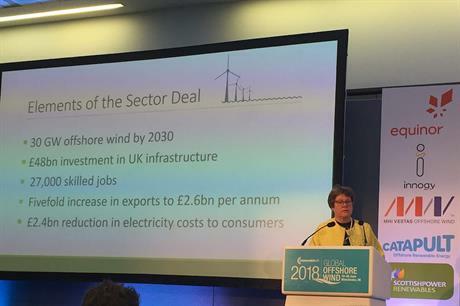 Baroness Brown of Cambridge, who serves on the UK climate change committee, argued at the opening session of Global Offshore Wind 2018 conference in Manchester, that the benefits to the UK economy made the proposition a "no-brainer". RenewableUK claims a 30GW offshore wind target by 2030 would mean a £48 billion (€54.6 billion) investment in UK infrastructure, create 27,000 skilled jobs, would increase the sector’s earnings from exports fivefold to £2.6 billion a year, and reduce electricity costs to consumers by £2.4 billion a year. The UK has a little over 7GW of operating offshore wind, which indicates that around 2GW a year of new capacity will need to be installed to reach the 30GW target. "That may sound a bit of a step-up from where we are today, but the industry is confident it can deliver," said Baroness Brown. "Having the largest installed base in the world means the UK has more experience of installing and operating offshore wind than anyone else. If we don’t capitalise on that experience now, then other countries will fill the gap," she said. Claire Perry MP, the UK government’s minister for energy and clean growth, was due to speak at the conference, but was held back in London for a crucial Brexit vote in Parliament. RenewableUK is confident that it has Perry’s support for the new target, but concedes that it the Treasury that will ultimately call the shots. Several delegates at the Manchester conference, including Jonathan Cole, offshore managing director of Iberdrola Renewables, have called for the UK government to provide greater pipeline visibility. "Does the government really get how important this is?" asked Julian Brown, former chair of RenewableUK.